Shopping for clothes as a man can be a daunting challenge. Finding a place that you can trust is paramount, but it also needs to have the right selection too. Founded in 1992 in downtown Barrie, Ontario, John McNabb Clothier is dedicated to bringing you the best in traditional and contemporary . With a large selection of premiere international and Canadian made brands, what you'll find is a unique and well curated menswear selection. We specialize in items of pedigree that are both stylish and made to last. Whether Samuelsohn, Coppley, or Van Gils in suits, Alberto and 34 Heritage in premium denim, or Robert Graham, Lipson or Bugathci in casual and dress shirt options, we have the selection to suit you. Whether you need a whole new wardrobe or are simply expanding an existing one, you can always be confident that John McNabb Clothier will help you find what you are looking for. John McNabb Clothier is not just about touting a bunch of brands however. We believe that a brand of clothing can mean very little without the right advice, the perfect fit and someone to stand behind it. Our role is to serve and help you navigate uncertainty. We are not just offering the perfect suit, dress shirt, or sweater. What we are providing is a sense of security, confidence and joy in the wearing of them. At John McNabb Clothier we love what we do and we use our knowledge and experience to cater to your unique needs. 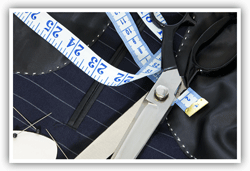 With decades of experience, friendly and knowledgeable associates, and in-house tailoring, you can be assured that we will be working for you, not just for the sale.